Sterling Shepard is a young American football athlete who wears the No. 87 jersey for the New York Giants. He launched his professional career in the year 2016 when he was selected by the Giants in the second round of the 2016 NFL Draft. An exceptional wide receiver, track and field star and basketball player, Shepard inherited his athleticism from his father, who carved out a niche for himself on the football pitch in his lifetime. The New York Giants wide receiver was born into a family with an extensive football background on the 10th of February 1993. He was born to Derrick Lathell Shepard and Cheri Shepard, who are also parents to his sisters – Shelby Shepard and Ashleigh Shepard. Sterling studied at Heritage Hall School in Oklahoma City, Oklahoma and later at the University of Oklahoma for his college education. While he was at Heritage, he caught 133 passes for 2,335 yards, rushed for 1,115 yards, and also gained 38 touchdowns in his junior year. As a senior, he recorded 8 touchdowns, caught 73 passes for 17 touchdowns and 1,243 yards, and also moved the ball 28 times for 303 yards. After finishing his senior year, Sterling got selected to the Under Armour All-American Game. Besides football, he was also good in track and basketball as well. In 2011, as a senior in high school, Shepard emerged second with a leap of 6.69 meters in the long jump at the State Meet. He began his college career under the guidance of coach Robert Anthony Stoop, whose coaching career lasted from 1999 to 2017. In his freshman year, he featured in 13 games, having made his debut on the 8th of September in a game against Florida A&M. Throughout his collegiate career, the wide receiver recorded his best game on the 14th day of September 2012 in a game against Tulsa. In the said game, he gained eight receptions for 123 receiving yards and two receiving touchdowns. In 2015, in his senior year, Sterling Shepard featured in all 14 games, recording 86 receptions for 1,288 yards and 11 touchdowns. Details of his collegiate career statistics indicate that he recorded 233 receptions for 3,482 yards and 26 touchdowns. His professional career began in the year 2016 when he was picked as the 40th overall in the second round of the 2016 NFL Draft by the New York Giants. 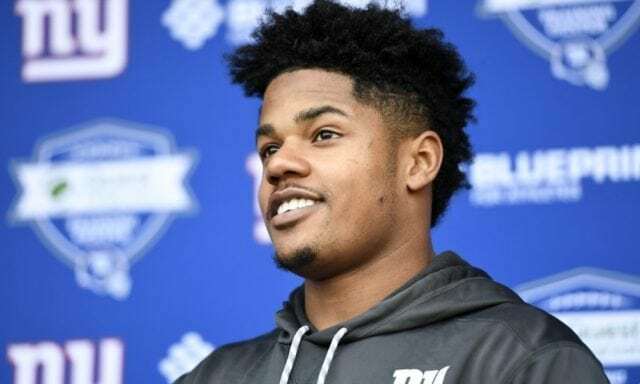 Sterling Shepard was the fifth wide receiver to be chosen selected that year’s draft. The wide receiver has a net worth estimated to be $11 million. He reportedly earns $1, 486,143 annually from his four-year contract with the New York Giants. Both parties signed the deal 6th May 2016. The contract worths $5.94 million and comes along with a signing bonus of $2.52 million and $3.24 million guaranteed. As we mentioned earlier, Sterling is the son of Derrick Lathell Shepard, a prominent American footballer who featured for the Dallas Cowboys, Washington Redskins, and New Orleans as a wide receiver in the National Football League (NFL). Born on the 22nd day of January 22, 1964, in Odessa, Texas, Lathell had his high school education at Odessa High School, where he was successfully converted to a wide receiver in his freshman year. Shepard was originally a wishbone quarterback. After completing his high school education, the footballer proceeded to the University of Oklahoma to pursue his college football career. Sterling’s father was signed as an undrafted free agent after the 1987 NFL draft by the Washington Redskins, after which he was signed as a Plan B free agent by the New Orleans Saints on March 7, 1989. His stint with Dallas Cowboys began on October 4, 1989, and he was later released on August 31, 1992, following a right ankle injury that impacted on his speed as a wide receiver. Shortly after Derrick retired from playing football, the 5 feet 10 inches player was hired as a graduate assistant at the University of Oklahoma, from where he moved to the University of Wyoming to serve as the wide receivers assistant coach. He passed away at the age of 35 on the 4th of August 1999 after suffering a sudden heart attack while playing racquetball, in Laramie, Wyoming. He has two older brothers who also represented the University of Oklahoma in the college league. Their names are Darrell Shepard and Woodie Shepard. The former played for Oklahoma from 1979 to 1981 while the latter represented the university in the league from 1975 to 1979. Sterling Shepard has a beautiful woman he calls his wife. Her name is Chanel Iman, an Atlanta-born supermodel. Iman, born Chanel Iman Robinson, on December 1, 1990, is well known for her work as a Victoria’s Secret Angel. The daughter of Tic Price and China Robinson, she got married to the New York Giants wide receiver in 2018. The couple welcomed their first child on August 10, 2018. Her name is Cali Clay Shepard. As little as Baby Shepard is, she is already an Instagram star with 6,744 followers and counting. The Oklahoma-born football athlete weighs 88 kilograms which is equal to 194 lb and stands at a height of 1. 78 meters, which is equivalent to 5 feet 10 inches to match.